Jack’s Mannequin has captured in their sound the airy spirit of Southern California, as witnessed in this week’s irocku exclusive, Dark Blue. 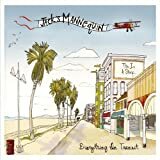 Written by McMahon while on hiatus from Something Corporate in 2004, Dark Blue was included in the 2005 release, Everything in Transit. The album reached number 37 on the Billboard charts and set the stage for a summer tour in support of the release; however, McMahon was diagnosed with acute lymphoblastic leukemia and had to undergo chemo treatments before the tour could begin. McMahon has made a full recovery and the band returned to the road and studio and has been going strong ever since. Dark Blue begins with a bright, up-tempo piano intro with the drums and other instruments joining in after a few bars. The sound is airy and windswept, aided by the beautiful vocals of McMahon that crescendos into a flawless falsetto. The two entities are a perfect match, the vocal drives the song along Pacific Coast Highway while the music’s melodic tempo and pulsating beat evoke a feeling inherent in the optimism of sunshine, blue skies, and endless beaches. If you want to know what Southern California feels like then, Dark Blue by Andrew McMahon is the song for you, a must for serious piano players looking to develop their overall musical chops! Andrew McMahon is considered by many to be the current generation’s Billy Joel. He is a passionate and talented singer/songwriter. In Dark Blue, Andrew engages the I, V, vi, IV chord progression that is found everywhere in rock and pop. It’s a must learn. Levels 1 and 2: Practice the C Major scale.First Week: Beginners practice the Lesson. Intermediate and Advanced students practice the Groove Chart and the Lesson. Second Week: Add the Exercise and Improvisation to your practice. The alternating eighth note pattern in the left hand is lays down a smooth flowing groove to improvise over. You can use the notes of the Eb major scale in your right hand or work through the Eb, Bb, Cm7 and Ab progression. Level 3: The quickest way to rock is by learning the Groove Chart! To help with improvising, practice the Eb Major scale. Also learn the Eb, Bb, and Ab chords.First Week: Beginners practice the Lesson. Intermediate and Advanced students practice the Groove Chart and the Lesson. Levels 4 and 5: The quickest way to rock is by learning the Groove Chart! To help with improvising, practice the Eb Major two-octave scale. Also learn the Eb, Bb, and Ab chords.First Week: Beginners practice the Lesson. Intermediate and Advanced students practice the Groove Chart and the Lesson. Levels 6 and 7: The quickest way to rock is by learning the Groove Chart! To help with improvising, practice the Eb Major three-octave scale. Also learn the Eb, Bb, and Ab chords.First Week: Beginners practice the Lesson. Intermediate and Advanced students practice the Groove Chart and the Lesson. How about some new lessons? The lesson pdf for level 2 is only the intro but in the video he plays the chorus. What did I miss? This was quickly corrected. Thank you , IROCKU. In another lesson Collin mentioned laying off the pedal to avoid a muddy sound. But I’m wondering how much, if any, pedal he’s using on this tune and one like Little Martha where there’s a steady legato in the left hand. Never use pedal while learning a piece, even if it is indicated in the score. Avoiding the use of the pedal can help a player develop precision and clarity in playing, whereas excessive use often causes muddiness and the development of bad technique. Once you are able to play a piece well without pedal, go ahead and try adding it sparingly. The pedal not only creates a longer sustain, but a fuller resonance in the piano, which may not always be appropriate for a tune. So, it is really a matter of taste! Our advice: don’t start using the pedal until you sound good without it. When there is no pedal notation, observe when the chord changes. Clear the pedal for each chord change. Always keep the pedal off for sections where there are major, minor or chromatic scales used. (scale passages using major or minor 2nds) In some cases, pedal can work during pentatonic or whole-tone scale passages. Use your ears! Me playing “Dark Blue” level 5. Thanks irocku. I definitely am used to classical music and this will be an excellent way of stretching my playing skills. I’m so glad I started working on “Dark Blue”. It had the most interesting melody of those I previewed. You might want to check out ‘Little Martha’ also. It’s an absolutely beautiful piece. And a charm to play. Thanks, I just ordered Little Martha intermediate level. Would it be possible for me to play the advanced levels? Do intermediate people sometimes order those lessons even though they are too difficult for them to play. If you are going to play something above your current level of difficulty, you might be best off working your way up to it. So if you are a level 3 and want to play the level 5, spend some time learning all the components of the level 3 ( groove chart, improv, lesson, and exercise), then the level 4, and then move on to the level 5. We introduce specific skills and techniques at each level which might be frustrating to learn if you begin at a level that is too far out of your reach. We have many students who want to master one particular song and they work their way up starting at the beginning levels. Do whatever works best and is most enjoyable to you. The groove chart only has the chord and no notes written in. I know I should be an intermediate piano student but can I get you to write them out. Great comment! We hear this often from classically trained musicians. Our goal at irocku is to not only teach you how to play piano but also how to play rock piano. Less than 20% of professional rock musicians know how to read music. They all play by learning chord structures, progressions, and they master the scales ( major, minor, blues, pentatonic, and mixolydian for sure). The Groove charts are designed to teach you how to ‘comp’ with a band but also to get you away from the musical page so you can interpret the song for yourself. First learn all the chords in the Groove Chart and then learn the scale used in the song. In the case of “Dark Blue” it would be Eb. In the right hand you should play the chord listed above the staff, in any inversion you prefer, but play it using the designated rhythm, which in the case of the intermediate groove chart is quarter notes. Be sure to change chords as you follow along. In the left hand play at least the root of the chord, or the root and fifth or any combination of notes from the chord that sound good to you. The ‘Groove Chart’ for “Dark Blue” is very basic so once you master it you might want to throw in some riffs or arpeggiate the right hand. The important thing is to throw in ideas of your own while keeping the beat steady. You can visit ‘Tools and Resources’ page to learn the chords and scales. Enjoy!! !